The last time we saw a black woman as a serious contender for an Olympic medal in figure skating was 1998. The same year that Monica Lewinsky scandal began to unfold in the White House and the Denver Broncos won Super Bowl XXXII, France’s Surya Bonaly went after an Olympic title for the third time. There hasn’t been another skater at the Olympic level that has looked like Bonaly until this year. Two black French skaters, Maé-Bérénice Méité and Vanessa James, are competing in Pyeongchang, South Korea, although neither is likely to medal. More people watch figure skating during the Olympics than at any other time. Still, viewership of the 2018 Winter Olympics is lower than it was four years ago in Sochi, Japan, and far below the ratings during the 1994 Lillehammer Games, when Nancy Kerrigan won a silver medal. She did so after recovering from an attack initiated by people affiliated with rival skater Tonya Harding. While judges may love ice princesses, a much-debated term describing women and girls who skate with the right (and arbitrary) mix of finesse and athleticism, the public seems more partial to “bad girls.” These ladies are social and physical boundary-pushers. Harding earned the title because of her connection to the attack on Kerrigan. Bonaly was crowned when she knowingly performed an illegal move, a one-legged backflip, at the 1998 Nagano Olympics. Rightly or wrongly, bad girls seem to maintain the spotlight in ways their well-behaved counterparts do not. But it’s important to remember that bad girls grow up and create new stories to tell. Harding has gotten a chance to add complexity to the narrative around her story; it’s time for Bonaly to do the same. The 44-year-old is still commonly called a rebel. Videos are all over the internet of her infamous one-legged backflip (she says it’s called the Bonaly) and the time she refused to accept a silver medal at the 1994 World Championships because she thought she deserved the gold. But she’s tired of being called an r-word and wants the world to know her history is complex and her future is more than figure skating. “I’ve been approached by a French film director,” said Bonaly, “but nothing has been confirmed. I just don’t want it to focus on that one event [during Worlds]. There’s more to my life.” For instance, she was adopted and raised in southern France by a white French couple. Her biological mother is from Réunion, a French island off the coast of Madagascar, and her biological father is from the Ivory Coast. She participated in several sports when she was a child, not just skating. Since the release of the Harding biopic I, Tonya, calls for a movie about Bonaly have ensued. Helping someone produce a film about her life is not her main priority. For starters, Bonaly moved from Las Vegas to St. Louis Park, Minnesota, to be with her then-fiancé, now husband. Both are coaches. “I love this life, but it’s borderline boring. I’m used to traveling and being on the go,” she said. Bonaly skated competitively as an amateur for nearly 20 years. But after the Nagano Games, it became clear that she would no longer compete for France at the amateur level. She turned pro and spent the next decade skating in shows such as Champions on Ice and competing professionally. Not much changed about her schedule, other than she was getting paid to perform. Bonaly continued to dazzle audiences with triple jumps and backflips, spending roughly 10 months out of the year touring. The rest of her time went to coaching in Colorado and Las Vegas. “The ’90s was the golden age of figure skating. Everyone watched [the sport], so you could make a living as a professional skater — not like now,” Bonaly remarked. African-American figure skater Carrie Maultsby-Lute agreed. The 39-year-old skated competitively for 13 years before turning pro in the late 1990s, around the same time as Bonaly. The two eventually skated together in a show for the organization Friends of Minority Figure Skating. They also both skated for Ebony on Ice, but not at the same time. Like Bonaly, Maultsby-Lute participated in other shows, such as Disney on Ice, where she earned about $30,000 per year with traveling expenses paid. “[It was a] great gig for [a] 19-year-old,” Maultsby, who now works as a marketing professional and college instructor, wrote in an email. Around 2004, professional competitions and several ice shows closed. Bonaly laments how little professional skaters now make compared with professional hockey players. As a result, she had to rely more on coaching. 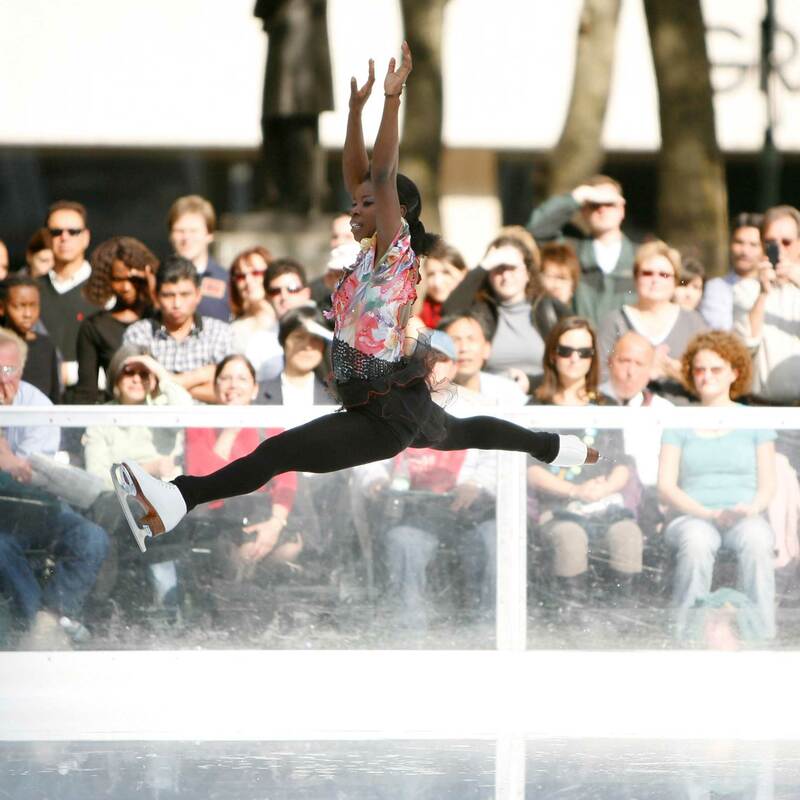 Figure skater Surya Bonaly performs at the 2008-2009 season grand opening of The Pond at Bryant Park October 27, 2008 in New York City. In 2014, Bonaly was invited to join the 75th anniversary tour of Holiday on Ice. At the age of 40, she was doing 10 to 11 shows per week over the course of four months. By that time, she had been suffering from knee and back pain for several years. That was probably her last tour. She’s no longer doing triples or backflips. In 2016, she started coaching full time. She now spends her time teaching about 15 skaters at several different rinks in Minnesota. Coaching is a popular next step for retired skaters, but it’s not always easy. Maultsby-Lute held titles as Indiana state champion and tristate champion and was at one point one of the top 100 skaters in the nation. Despite these accolades, she had difficulty finding coaching jobs. Bonaly had more luck. If coaching hadn’t worked out, being a judge would have been another option. But Bonaly didn’t see herself in that role. Most recently, the judging of the 2014 Olympic ladies short program was called into question after the winner was seen hugging a judge who voted to give her the gold medal. The incident fueled an investigation into judging bias. Dartmouth economics professor Eric Zitzewitz conducted a study that showed that judges tended to favor skaters from their own countries. Twenty years earlier, Bonaly publicly protested her second-place finish at the 1994 World Championships because she skated nearly a clean program, meaning she performed all of her jumps and spins perfectly. However, the gold medal went to Japanese competitor Yuka Sato. The difference between the scores for both skaters was marginal. Out of a 6.0 scale that is no longer used, Sato’s marks ranged from 5.7 to 5.9, while Bonaly’s were from 5.5 to 5.9. Sonja Kaminski, who has worked as a U.S. Figure Skating Gold and Regional judge for 28 years, agreed that Bonaly’s style was unorthodox, but is certain race was a nonfactor. “Surya Bonaly was judged on her performances. Race had nothing to do with her scores. Coming from a competitive gymnastics background, she had an unorthodox jumping and technical style, which, at the time, was not in line with the traditional style of skating that was expected and accepted by the broader skating community. That time in skating was the ‘age of elegance’ and both Surya and Tonya [Harding] displayed athleticism, not finesse. Surya was also inconsistent in her performances. She would make errors in her programs, which opened the door for the judges to give her lower scores and gave other skaters the opportunity to move ahead of her,” Kaminski wrote in an email. 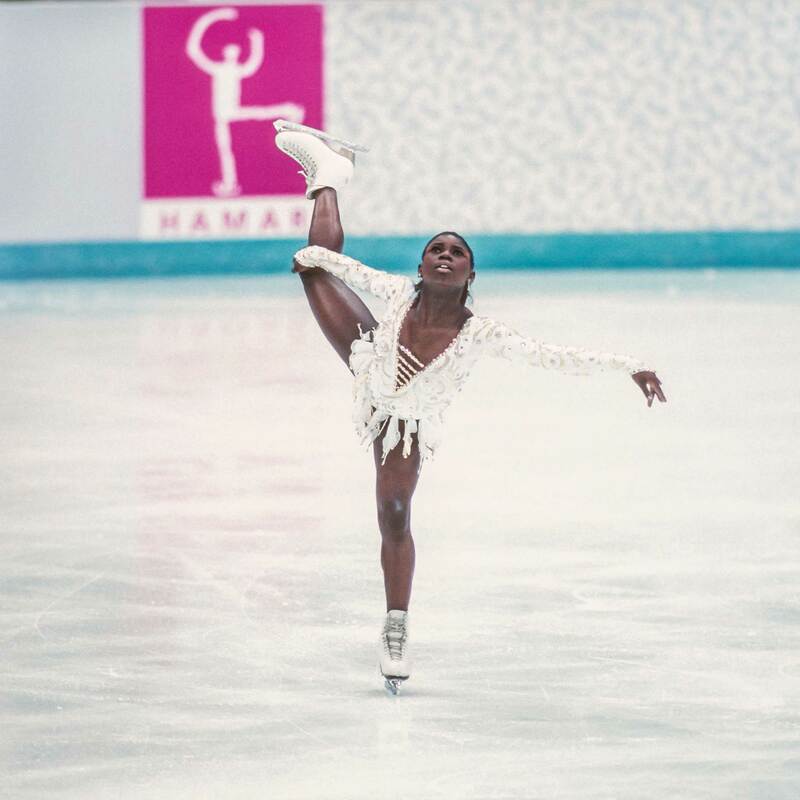 Surya Bonaly of France competes in the Free Skate portion of the Women’s Figure Skating singles competition of the 1994 Winter Olympic Games on February 25, 1994 at the Hamar Olympic Amphitheatre in Lillehammer, Norway. I had been figure skating competitively and training at the Olympic Training Center in Colorado Springs, Colorado, around the time of the 1994 World Championships. My father, Alfred Mathewson, remembers thinking that race may have played a role in the ruling at the time. South Africa’s apartheid system had only ended in 1991, the Rodney King beating and Los Angeles riots occurred a year later, the Rwandan genocide and the U.S.’s decision not to intervene would begin a month after the Olympics ended, and the racially charged O.J. Simpson trial would begin in 1995. Given this context, it was conceivable for some that a dark-skinned figure skater would be judged unfairly on the world stage. My mother, Pamelya Herndon, on the other hand, thought Bonaly was an incredible jumper but was not so impressed by her artistry. We had regularly watched Bonaly, Kerrigan and Debi Thomas in an effort to understand what form and style I should embrace. “Surya didn’t skate as an extension of her music; her music was in the background of her jumps,” she said. Bonaly acknowledged that she may have been ahead of her time. Figure skating’s new scoring system assigns numeric values to jumps, spins and other technical elements in a skater’s program. Skaters are also evaluated for artistry. They can gain or lose points depending on what point the element is performed in the program and how well it is performed. The new system was implemented to help standardize scoring and reduce corruption. Both Bonaly and Kaminski speculate that the French skater may have scored higher under this system. Additionally, Bonaly could have benefited from new rules governing what music and fashion skaters can use. Amateur competitors were only recently permitted to skate to music with vocals. Pants and unitards, a style Bonaly rocked from time to time, are also newly acceptable as competition dress. Before 2004, only instrumental music would be heard at the Olympics and women were expected to wear skirts that covered the hips. No matter what people critique or praise about her style and actions, Bonaly said she has no regrets. “I did my best, but I can always do better,” she said. Bonaly fancies herself to be somewhat of a DJ and tries to help her students identify music that balances personality with class. She’s not a fan of skating to hip-hop during the Olympics. “How many times can you listen to Stravinsky’s “Firebird”? There are so many talented composers out there, so much music to choose from,” Bonaly said. But skating to the perfect song or wearing the perfect dress won’t prevent a skater from falling, or believing she should have scored higher than an opponent in competition. If Bonaly’s students question the decisions of a judge, she advises them to review the tape of the performance. “If you don’t skate a clean program, you’re usually not going to win gold,” she said. This response is almost shocking, coming from a woman who vocally condemned the results of judges more than once. But those incidents are more than 20 years old. Bonaly still considers herself to be fearless, but she’s no longer a fiery teenager out to prove her athletic dominance. She just wants to talk about something else — such as working as a Peace and Sports Ambassador, and her desire to become a motivational speaker. As an athlete, as a black woman who did not let disappointing finishes deter her making a career out of a sport she loved, I’d listen to whatever she has to say.